Make skiing fun, not work. Women can become a better skier with less effort and have more fun. So find out about women’s only gear and ski programs. In the 1970’s women skied on the same equipment that men did. Women skiing on men’s skis is more difficult and more work to make turns. Then came Jeannie Thoren, a competitor who found that when making adjustments to her equipment she could be a better skier. Jeannie found that making specific changes to her equipment helped women ski better. Jeannie was influential in getting the ski and boot manufacturers to incorporate these changes into women specific product lines. So before signing up for your next ski lesson, go to your local specialty ski shop such as Alpine Accessories and find an experienced ski pro to ensure you have women’s specific gear and a great boot fit. You will find you can progress much quickly with the proper gear. Look for one of the many resorts that have women’s only programs. Women’s ski camps, workshops and lessons help women reach their full potential. Because the atmosphere is fun, uplifting and motivating you will learn more. The programs are taught by women instructors who want to share their passion and knowledge. The instructors will give you a supportive environment to help you learn how to perform your best. 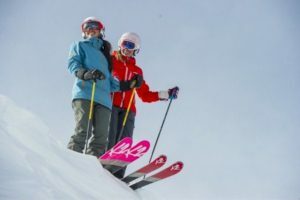 Some of the major areas have already been compiled by ski.com and outsideadventureguide.com, yet many areas have added women’s only programs as well. Therefore, here is our additions to their lists. The Blue Mountain Women’s Workshop is a 6-week program for female skiers and riders of all abilities, ages 21 and up. Participants must be able to ski or ride green trails and have a season pass or lift ticket. Choose one or more sessions! Massanutten Ladies Skiing Clinics are held Thursday mornings from 10am – 12pm for the intermediate skier at Massanutten Ski Resort at 4620 Massanutten Dr, Massanutten VA 22840. Call 540-289-4921 to make a reservation. Massanutten has 14 trails, 7 lifts on 70 acres of skiable terrain in northern Virginia. North Star 4 Her Women’s semi-private lessons are available for all levels of skier. Small groups of 4 are based on ability level. Lessons are from noon to 3:15 pm and includes lift ticket, demo equipment and lesson. Northstar California Resort is a few miles from Truckee and is a 3000 acre area with 19 lifts and 93 trails in the Lake Tahoe region. Heavenly Half-day Women’s lessons are available only during the Peak Dates at the California Ski & Ride School. Heavenly on the Nevada / California border is an enormous 4800 acres with 97 runs and 28 lifts. A 48 hour advance reservation is required by calling 530-542-6904. Whitefish Mountain in Montana has half day women’s lessons. (click on their Programs link) You get 8 sessions over 9 week period (no class Presidents Day weekend), on Wednesdays, from 10am – Noon from January 4th through March 8th. Meet new ski buddies while improving your skills in a group of women of similar skill level. Sign up by 12/31/16 for $305 not including lifts or lunch. The lessons includes video analysis and après ski after last session. For skiers of all abilities. Whitefish Mountain has 3000 acres of terrain with 105 runs and 14 lifts. Bromley Mountain Women’s Weekend has an exclusive female focused workshop to tune specific skills you’ve been dying to master. Let their wonderful lady clinicians hand feed you gems of ski and snowboard awesomeness all weekend. For $399 you get lessons, video analysis, lunch, cocktail hour, 6 to 1 student to instructor ration, boot fitting clinic, group photo and an instructor email follow up, Optional activities at an additional cost include a dinner out with the group, demoing new equipment and lodging. Call 802-824-5522 for reservations. Bromley Mountain at 3984 Vermont Route 11, Peru VT 05152 in southern Vermont has 178 acres area with 47 trails and 8 lifts. Smugglers Notch Snow Sport University Program for Women takes women ages 18 plus in small groups led by expert female coaches to get tips and fine tune their skills in a supportive atmosphere. The program includes meals, 50% discount on children’s camps and slopeside nursery. Most of all there is a complimentary après cocktail time to discuss a fun day on the snow. Weekend, weekday or multi-week programs are available. Call Ski & Ride at 800-523-2754 to make a reservation. Smugglers Notch at 4323 Vermont Route 108 South, Smugglers’ Notch, VT has 310 acres, 78 runs, 8 lifts. Windells Summer Ski Camp and Winter Camp at Mount Hood Oregon have Girl Only On Hill clinics at all of their sessions. Kids camps are for those 9-20 years of age and the adult camps one must be 21 plus. Wilmot Mountain Women’s Program has weekly Thursday morning women’s lessons from 10:00 am to noon for $35 not including lift pass. Women of any ability level can learn from women instructors who designed the program. Wilmot Mountain in Wisconsin has 120 skiable acres, 23 trails, 7 lifts. Also there is night skiing until 10:00 pm. Alpine Valley Resort, East Troy WI has a women’s day a.m. lift ticket special every Thursday for $33 per ticket. (normally $39 on weekdays) Alpine Valley in southeastern Wisconsin has 90 acres with 20 runs and 13 lifts. The K2 Ski Alliance has built a community of women to inform about snow events and promote camaraderie.